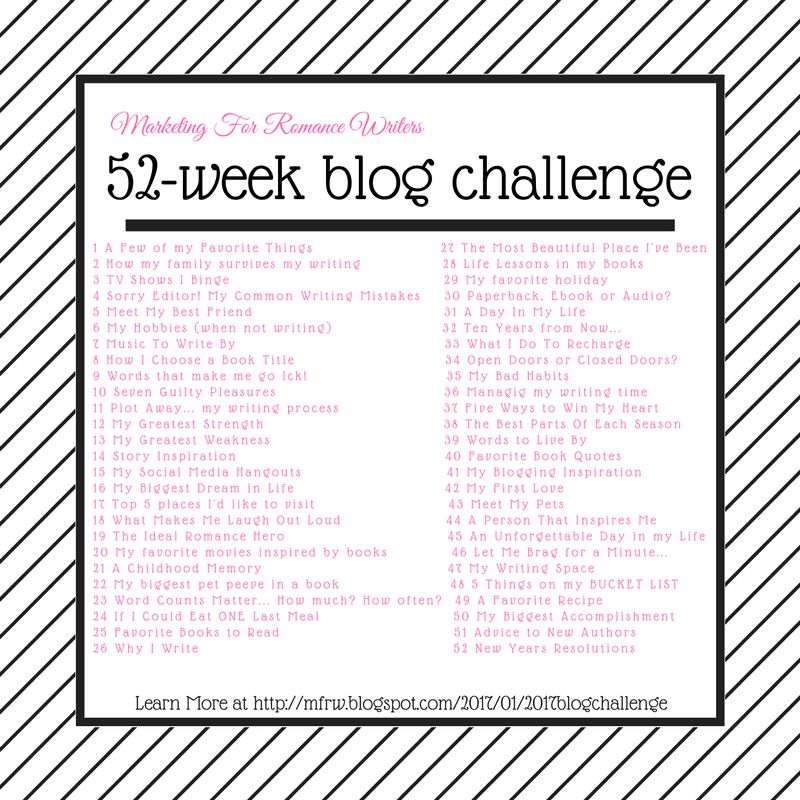 Welcome to the MFRWauthor blog challenge week 7. This week our topic is Music we write by. I wonder if I can count the flow of my fish tank, the hum of the refrigerator and the occasional cars that drive by. Maybe even all the kids screaming and dogs barking in the afternoon? I don’t have any set music I listen to as I write. As a matter of fact, I do better with it quiet (except for the above). On occasion, I may turn on Pandora or YouTube but most likely for research for songs my characters may listen to. I do sometimes have a playlist for each story but rarely do I listen while I write. Not the first draft anyhow. I need to concentrate. Sometimes I do play my playlist when I do my rewrite or edits to help get in the mood of the story, so each story will have me listening to different music. I am an 80’s rock girl, so that is what I listen to a lot. My daughter had me hooked o other things like Evanescence, Nirvana, Disturbed, so I have a list of songs she hooked me up on as well. I guess you could say I am diversified. Here are some of my favorites. I use to listen to music a lot while I blogged or did household chores now I listen to audiobooks instead. Now let’s go see what the other MFRWauthors like to listen to! What Kind of Music Do You Feed Your Ears? Finding THAT song. . .
Music & Writing My Two Favourite Things! I’m also an 80s gal who loves Evanescence, Linkin Park, and Melissa Etheridge:) Plus, I LOVED the tribute to Saturday Night Fever and the Bee Gees on the Grammys this past Sunday:) I was heartbroken when both George Michael and Prince left this world last year. I missed the Grammys! The Bee Gees were and still are a favorite for me I have lots of their CD’s I loved Geroge Michaels as well and that was so sad on his passing. Seems we have the same taste in music ! Have a great weekend. Oh, I loved that Adam Levine ballad! Like you, I can’t listen to music and write a first draft. Music takes me right of the story world! Thanks for stopping by Alina! I love Adam Levine! The music does take me out of it too sometimes I can listen during edits but never the first draft. Have a great weekend! I think you can count the background noise as your ‘music’ to write by. It’s helps even if you don’t really pay attention to it. Being diverse helps. I started working at a concert venue a year ago and I’ve been exposed to a lot more types of music than I would have listened to before. It’s hasn’t made me a fan, but it’s a new experience. I bet that is a cool experience, Meka. Eclectic. That word describes me well LOl. It’s interesting to see how each of feeds our muses, some with music, some with silence. I agree Linda. It is interesting to see how each of us work. I think its fabulous remake.